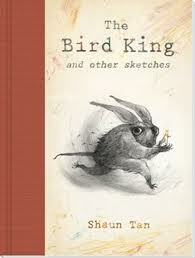 In the introduction to his latest book The Bird King, Shaun Tan quotes the artist Paul Klee, who once said something along the lines of “Drawing is taking a line for a walk.” Klee, if you aren’t familiar with his work, was an Swiss painter who lived from 1879-1940, taught at the Bauhaus school, and was part of the Expressionist and Surrealist movements. I love that Tan references him, because Klee was also interested in puppets. Using a rich combination of color and texture, he created a set of hand puppets for his son, many of which can be seen in these excellent photos on Flickr. Tan also quotes a second Klee metaphor, imagining the artist “…as a tree, drawing from a rich compost of experience–tihngs seen, read, told and dreamt–in order to grow leaves, flowers and fruit. Art, following the laws of horticulture, can only make something out of something else; artist do not create so much as transform.” Both of these quotations strike me as being entirely appropriate to The Amazing and Marvelous Cabinets of Kismet. Many times during this building process, I feel like I have been ‘taking my materials for a walk’–arranging and rearranging and seeing what shapes and characters emerge. So many of these characters have been created without a real design in mind, that it has felt both terrifying and liberating all at once. As a piece of theater, this is very much an example of Klee’s tree; it is art that draws from many different sources in visual art, story and film, and combines them into something new. This is reflected in the hodge-podge of materials we have been using to create our puppets and set, from paper scraps, to bottle caps to empty wooden spools. Tan comments in the same introduction that he is often “…wary of using the word ‘inspiration’…” and that “…it sounds too much like a sun shower from the heavens, absorbed by a passive individual enjoying an especially receptive moment.” I understand his hesitation, but for me, inspiration is less like a sun shower and more like a flash of lightning or a moment of recognition; something that makes me go YES. That is TRUE. Now DO something with it. Inspiration for me isn’t passive, it is active, a call to act and create. Tan’s books give me that moment of recognition often; so do Klee’s paintings. I feel so fortunate that I get to spend my time turning the inspiration they give me into my own art. This entry was posted in Inspiration and tagged creativity, drawing, imagination, inspiration, Paul Klee, quote, Shaun Tan by ccbooks. Bookmark the permalink.